When someone says, “It was a good death” they may mean that from their personal perspective it was a good death. However, a death is only a “good death” if the person who is/was dying is honoured and their needs, preferences and goals are considered as life circumstances change, disease progresses and care plans are developed. In striving to honour the individual, perhaps then we can talk about a good death, an appropriate or a person-centered death. But how many of these individuals have talked with people close to them about their preferences? How many have spoken with their health care team and recorded their thoughts? How many have documented Advance Care Plans? If wishes and preferences are not shared and documented, it may be difficult to honour and meet a person’s wishes for an appropriate death. This is where Advance Care Planning comes in. Advance Care Planning is one step in helping a person experience a good death, an appropriate, or a person-centered death. 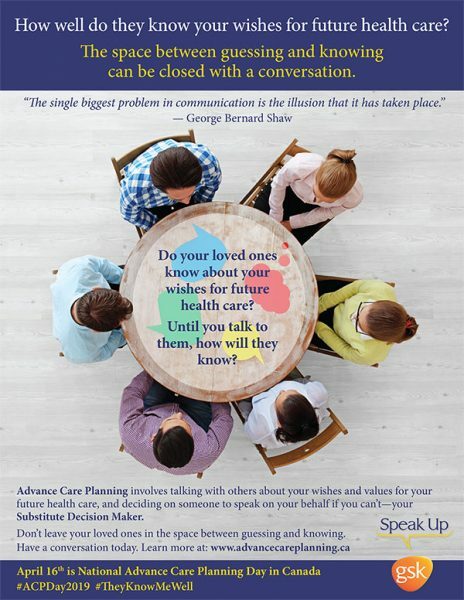 Advance Care Planning can greatly assist health care professionals to provide best care, to support each person to live life fully until their last breath, and to honour them following death. In the next decade, Baby Boomers may start benefiting from the integration of a palliative approach in their care. As this large and vocal portion of the population reaches their senior years and deals with life-limiting illness, it is possible that engaging in Advance Care Planning may become as normal as developing birth care plans for expectant parents. Today is Advance Care Planning Day. It is your day to discuss what is important to you, what you think you might like when you are sick, when you are declining, and ultimately, when you are dying. This is your time to talk with those who are close to you, to record your thoughts, and share your thoughts with your physician or nurse practitioner. Begin the conversation today and continue to discuss plans as circumstances change. Whatever your preferences, today is the day to open the door, and set a time to talk with someone who is important to you about your wishes. The Speak-Up Campaign provides resources to stimulate conversations and guides to help you record thoughts. In the United States, the National Healthcare Decisions Day and the Conversation Project provides resources for making your wishes known. The Life and Death Matters Care Planning Cookies can stimulate conversations. This entry was posted in Advance Care Planning, Hospice Palliative Care. Bookmark the permalink.